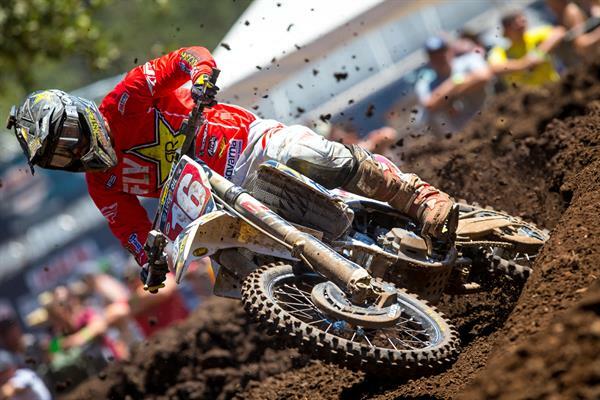 HomeNewsROCKSTAR ENERGY HUSQVARNA FACTORY RACING’S MARTIN DAVALOS HAS LANDMARK DAY AT WASHOUGAL NATIONAL! August 1, 2017 Michael Le Pard News Comments Off on ROCKSTAR ENERGY HUSQVARNA FACTORY RACING’S MARTIN DAVALOS HAS LANDMARK DAY AT WASHOUGAL NATIONAL! The Rockstar Energy Husqvarna Factory Racing team had a successful day at the ninth round of the Lucas Oil Pro Motocross Championship held at the Washougal National in Washougal, Wash. on Saturday. 450 rider Martin Davalos earned his first career 450 podium by going 4-3 for third overall, Zach Osborne rebounded from a back-of-the-pack start in the first 250 moto to finish 4-3 for second overall, and Dean Wilson earned another top-10 finish in the 450 class and maintained his spot at fourth overall in 450 rider point standings. Martin Davalos got an excellent start in the first 450 moto and immediately started going after the lead. He put on a charge and stayed on leader Marvin Musquin, waiting for his opportunity to strike. He continued to charge before getting passed in the whoops and eventually went back to fourth in the third lap. He kept his head down and finished fourth. He pulled the holeshot in the second moto and held his ground until moving back to second in the third lap then third in lap four. Still in overall podium territory, he rode hard to stay near the front of the pack and finished an impressive third. The strong ride gave him 5-3 for third overall and his first 450 career outdoor podium, and his first podium finish in over nine years. Congratulations, Martin! He is currently eighth overall in 450 rider point standings. Zach Osborne started farther back in the pack in the first 250 moto and came out of the first lap in 23rd. Having his work cut out for him, he charged from 23rd to 16th by the second lap and put on a blistering pace. He navigated his Husqvarna FC 250 into 10th by the halfway mark and was on the move. He put his head down once he got into the top-10 and charged into seventh with seven minutes and two laps to go. He thread the needle through lapped traffic and made another pass into sixth with four minutes to go before finishing a hard-fought fourth. He was top-10 at the start of the second moto and came out of the first lap in eighth. Moving at a steady pace, he was sixth by the fourth lap before navigating into fifth around the halfway mark and stepping it up a notch. He was on the move with eight minutes to go and made an unreal outside pass on Dylan Ferrandis to overtake fourth. He got things going again by making a pass on Adam Cianciarulo for third with three laps to go. He charged right to the end to finish third. The 4-3 finish gave him second overall on the day and maintains his point lead in the 250 championship. Dean Wilson was top-10 at the start of the first 450 moto and was fifth before the start of the second lap. He held his ground in fifth and stayed strong as he held off a hard-charging Weston Peick at the end of the race to finish fifth. He pulled a top-10 start in the second moto and was eighth at the end of the first lap. He made the pass for seventh around the eighth lap before making the pass on Justin Bogle for sixth in lap 10. He stayed consistent to finish sixth. The 5-6 finish gave him sixth overall on the day. He is currently fourth overall in 450 rider point standings. The team will now take a week off before heading to the 10th round of the series, being held at the Unadilla National on Saturday, August 12th in New Berlin, NY.